This was the final book signing at Unicorn books on Saturday afternoon - you can see the Goth Princess holding court at my right elbow. Phew! And thanks to you all. Saturday night I was able to catch up with some crochet buddies like Doris Chan, Ellen Gormley (who has some great news to share - go check it out), Vashti Braha and others. Monday was one last meeting, a frantic run through the market to look at all the new yarns I hadn't had time to look at earlier in the weekend, a class on the Moebius cast on with the fabulous Cat Bordhi, and the mad dash as soon as the show was officially over to grab my floor models from Bryson, Mango Moon and PolarKnit. One last Jeni's ice cream, and then the loooooong drive home. Want to see a quick video? Check me out here! The week since then has been a pile of sorting, catching up, working on new to-do lists, and falling asleep at inappropriate times. Just think, In January, we get to do it all over again! It's possible that blogging TNNA will take more hours than the actual weekend covered, but oh well. I can but try. A full page ad in the directory! 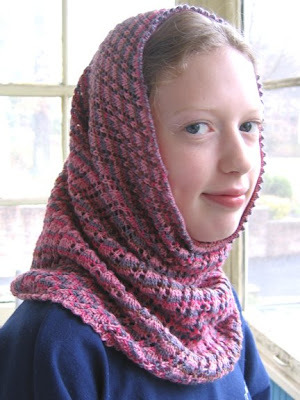 Most of those friends (some with more love, some with less) pointed out that it might be time for a new head shot - the one I have been using since Secret Language of Knitters is a mite serious. In fact one store manager held the page in front of her face and said "I am Mary Beth and you will crochet the way I tell you to OR ELSE!!!!!" which was actually a lot more amusing in person than it might have seemed in print. Speaking of signings... I have one in NYC at the Lion Brand Studio on July 9th at 6:00 PM. 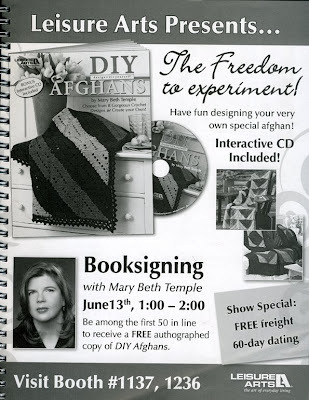 I will be reading, demonstrating stuff from the afghan book, and generally carrying on. Tickets are free but reservations need to be made ahead of time in the interest of not getting closed down by the fire marshall! Join me if you can - make your reservation here! Poor LL has 4 more days of school - but the last big project is done and delivered, so amen. We both are waiting with bated breath for the days when we can turn off the alarm and sleep as late as we like! More TNNA later - now I have to go get some editing and sketching done. 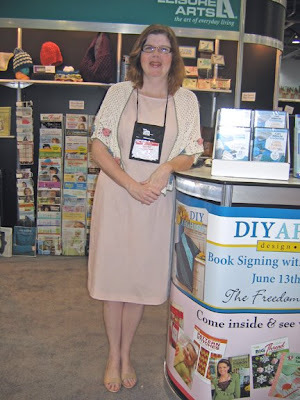 Back from TNNA and what a weekend it was! I don't have a whole lot of photos, partly because I was frazzled and rushed for most of the weekend, partly because cameras are frowned upon on the show floor, but I did manage to snap a few. On Thursday I drove to Lancaster PA to pick up Middle Sister, and then we both went out to Columbus. She did most of the driving because I was frantically trying to finish crocheting a model to hang in someone's booth! It was Swirly Beret and yes I did get it finished - thanks for asking! I had a class Friday morning with Sally Melville - she is a genius teacher and if you ever have a chance to take any of her classes, run don't walk to sign up. This one was Learning to Love Intarsia, and by goodness now I do. 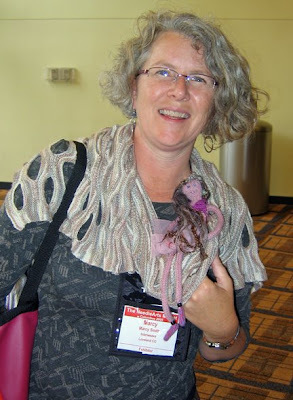 Marcy Smith, Getting Loopy podcast guest and editor of Interweave Crochet! She was carrying her pal WiMi who had to get into the photo. I ran around the market floor placing my models where they belonged - I had pieces in Bryson, Unversal Yarn, PolarKnit, and Mango Moon - then ran to North Market for lunch and my first ever Jeni's ice cream. Columbus regulars have been tweeting about the goodness that is Jeni's for the last few weeks and I had to see what all the fuss was about. All I can say is yummmmmmm. Friday night was teacher meet and greet - we were supposed to gather outside the fashion show and set up our classroom handouts, etc, at the spot where we saw our sign. I was happy to be sharing table space with teacher and designer extraordinaire Melissa Leapman, so I quick set up my things. Ah well - at least I will make money at the show one way or the other! Then there was the fashion show, which was the usual - a few amazingly good pieces, some average stuff, and a couple of howlers that made you scratch your head and lament the loss of perfectly good yarn. And then the Keep the Fleece party! Which was fun but chaotic, at least at the beginning. Cosmos and a chocolate fountain for dinner! Anyway, more TNNA posting later, for now I have to start plowing through my to-do list! 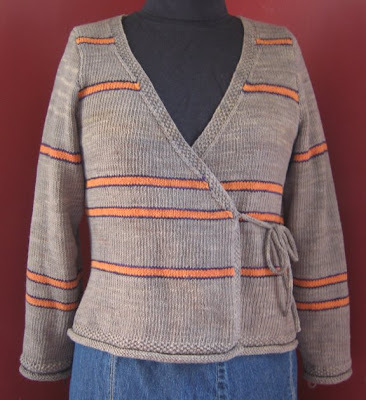 And this one is Banded Wrap Cardigan - you saw the sleeves in the last post! 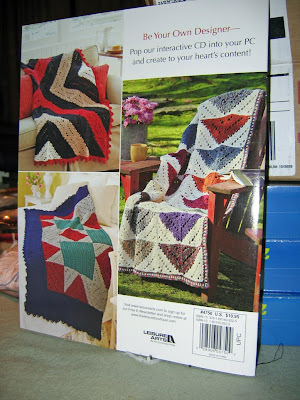 NOW AVAILABLE - I wanted the fine folks at Mango Moon to play with it first because it's in their new yarn. Back late late late Monday night - no Getting Loopy on June 15th! 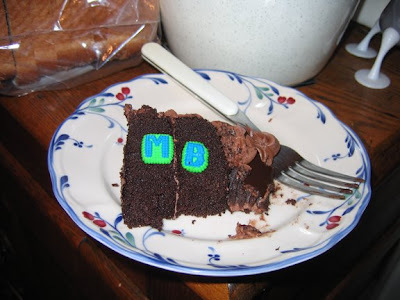 Anyway I was pretty aggravated, so LL brought me this - some yummy chocolate cake with my initials on it in leftover birthday cake letters. I wanted to be a great mom and tell her that one couldn't solve one's problems with chocolate, that I would be better off taking some deep cleansing breaths and moving on with my life but you know what? I like chocolate cake, and it did improve my mood, even if it wasn't the healthiest way to do it. One more teachable moment shot to hell! Later in the evening I was a guest on Marly's YarnThing podcast and we had a hell of a lot of fun. 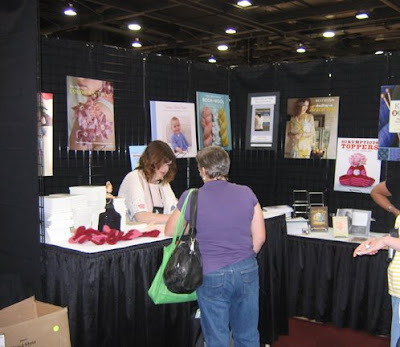 YarnThing is in the Blog Talk Radio network like Getting Loopy, and it was fun to be on the other side of the microphone if you will. Plus I love me some Marly - she is a natural and healthy mood enhancer all by herself because she is always looking on the bright side of things. Go check it out! I wasn't going to blog about it until I had somewhere to send you to buy it if you so desired, but I just can't wait any more. I really love how this came out - 8 afghans made from various crocheted building blocks, plus a CDRom that you can put in your PC (sorry Mac users!) 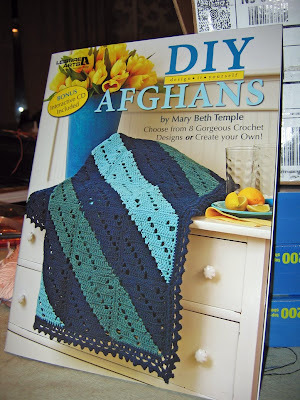 to make up and print out an afghan layout of your very own. It is shipping to stores now, and eventually will show up on the Leisure Arts web site! 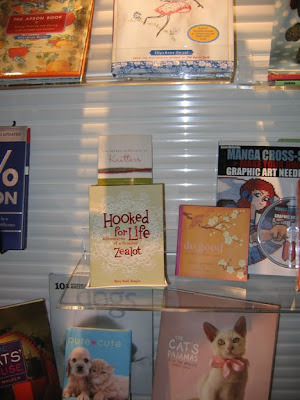 Please ask your LYS for it - and when they say that Leisure Arts booklets only use mass market yarns, you can point to the Mission Falls cotton and the Cascade 220 on the covers! And I am also quite happy to show you my newest crochet pattern - Damask. 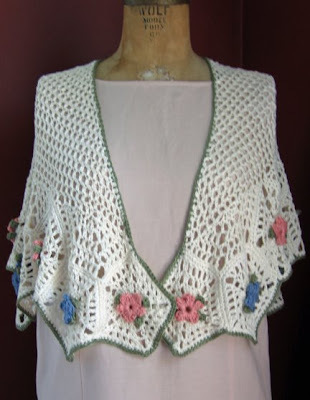 It is a small shoulder shawl made in Elann.com Pure Bamboo, and is silky, drapey and full of summer romance as all get out. I will be wearing it at TNNA on Saturday during my book signings. Those of you with itchy trigger fingers might notice that that is a Patternfish link. The Hooked for Life web site is being upgraded as we speak, but with my increasing focus on the wholesale side of my pattern business, it seems like a more time efficient practice for me to hand off the download process to someone who specializes in it. Patternfish does a lovely job, and every hour that I am not fiddling with downloads is an hour I can be busy creating more products - or you know, sleeping. 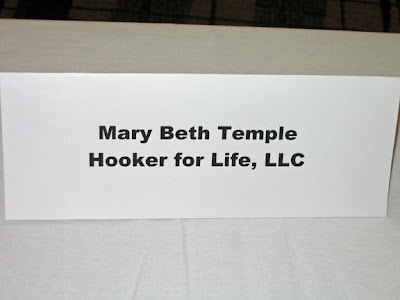 So Patternfish is now the official download source for all Hooked for Life patterns. Speaking of patterns, I have several hundred more than need to be wrangled into sleeve protectors, so I am off. 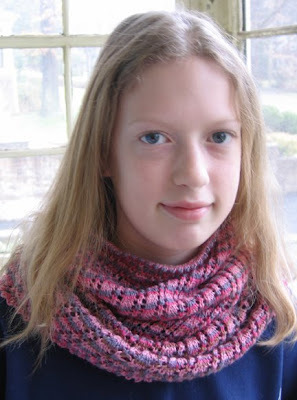 PS - Another one of my students has sold her first pattern and I am almost as excited as she is! If you are interested in taking Designing for Print Publication in July or September, please email Sarah@GettingLoopy.com for more information. 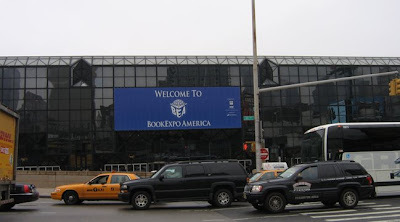 Book Expo America was at the Javits Center in NYC over the weekend, so I took a break from the knitting on Friday and went to look at books. Lots and lots and lots of books! 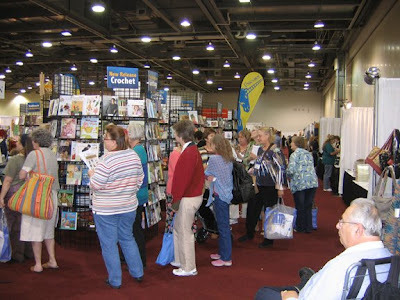 I had never been before and a lot of people I know in the publishing industry said it was smaller than last year, but I couldn't believe all the publishers and printers and PR folks and authors who were there. And there they were! In the Andrews McMeel booth, just where I was hoping they would be. I got to meet my publicist from AMP up close and personal for the first time, so that was a lot of fun. And I got some quality time with my agent, whose office is four hours away from mine, so that was good too. I of course want to bask in the glow of Hooked for Life and DIY Afghans both being finished and just starting to make their way into the world - everyone I spoke to Friday wants to know what book I am doing next! I guess I have to do some pondering on that topic, but not until after I get back from TNNA.